I hope you didn’t plan to get any work done today. This morning, POTUS Trump hit Twitter with yet another unforgettable tweet and the world was quick to respond. 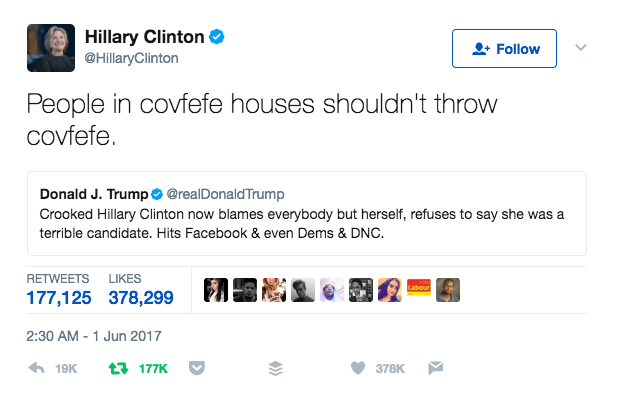 We’re loving the creativity and sheer speed of the #covfefe tweets and decided to share 10 of our favourites with you! Not a meme, but Hillary Clinton took Trump down to China Town with this wonderful response. Yes, this tweet is truly inconceivable. Sorry. Incovfefeable! This smells of another epic sci-fi drama on HBO. It’s not a true social media fail without an adaptation of Salt Bae. Get your Pokemon Go apps ready, it’s a rarity. A day in the Administration may well be just like an episode of The Office. Impressed by the quick reaction of the Eurostar staff.